Incessently rhyming about how "complicated" you are can be dangerous, but O.C. eventually backs up his claim. O.C. might seem like an odd fit with the Hieroglyphics crew: the former is a tough-rhyming New Yorker who's part of D.I.T.C., while the latter is an an eclectic, fun-loving West Coast collective. But it's all about rhyming, right? They share a love for hip-hop at its most basic. And they're all hip-hop veterans, with albums, years, and struggles behind them. Someone who is hip-hop-ignorant would be partially forgiven, though, for hearing the first handful of tracks on O.C. 's latest album, the Hieroglyphics-released Smoke & Mirrors, and thinking that he wasn't a legendary, perennially underrated MC but a newcomer trying to follow in the wake of Kanye West's success. The evidence? An intro about how he's "a walking contradiction... a hypocrite". An overblown, glitzy track with ego upfront and spiritual overtones underneath ("Martyr"). Two tracks ("You Made Me", "My Way") sporting high-pitch R&B vocals in the same vein, but vastly inferior, to what Kanye's doing. On the whole Smoke & Mirrors isn't the work of a coattail-rider, though, just an album that shifts focus a few times along the way. Stylistically it's an album in three acts, or perhaps four. The first part is the overblown stabs at success in today's market. The middle section of the album convincingly goes for an introspective mood, with O.C. rhyming about life struggles over mellow beats, along with guest Hieroglyphic MCs here and there. These tracks come off as down-to-earth and sincerely personal, though they aren't spellbinding or especially riveting. The soulful breakup song "Gone" succeeds best by being the most specific, taking the serious tale of a relationship's disintegration and capturing it in a visceral way. The album gets a harder edge for a few tracks, as the mellow mood segues into tougher beats and O.C. beefs up the force of his rhymes. "The Good, the Bad, the Ugly" reiterates his "I'm complicated" message in a three-verse format that seems trite but actually works. It's a powerful track, as is "Guns and Butter", a tight commentary on the hip-hop business. Something strange happens with this tough side, though. As he gets into it, he starts loosening up, sounding less concerned with what listeners might think of him. As he does that, he begins to emulate hip-hop styles of the past, taking the album in yet another direction: backwards in time. On "I'm Da Boss" he adopts the persona of a mob boss, while changing the style up to make it sound like the track could have been cut in 1989. A fake newscaster voice gives reports of "boss" O.C. 's misdeeds (a hokey but fun trick that seems like it could have come off so many of the early crime-rap albums), while a retro Run-D.M.C.-style guitar throws a dark but cheesy cloak over the tale. 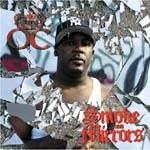 From that point on, Smoke & Mirrors turns into a dizzying amusement park ride through hip-hop past. Much of the time O.C. and producer Mike Loe go for, and attain, a fetching simplicity reminiscent of Main Source (and Large Professor's classic "lost" album The LP), with a '70s soul vibe to boot. But they depart even from that template on "Shorty", the album's biggest surprise and best track, where O.C. rhymes over a bling-bling disco beat that Puff Daddy might have liked and makes it not just work, but sound beautiful. It's a truly weird song, with the sort of bare-bones MC who evokes the word "purist" rhyming to a flashy beat, telling the story of warding off the advances of an under-age girl. The beat makes the tale seem silly, but he rhymes as serious as cancer, like he knows the trouble you can get into by making the wrong move. The track balances darkness and light so well, sounding like a would-be radio hit while bringing O.C. 's rhyming skills into focus, not dumbing them down even within the context of a song so simple then "dumb" does work as a description, not an insult. O.C. 's obviously in a different place than he was when he created classics like "Time's Up" and Jewelz. With Smoke & Mirrors it's hard to get a grasp on what that place is, but that's ultimately what makes the album so much fun. As it proceeds, it shakes off the nervous and dull sides of the opening tracks and gets a new life. The journey of Smoke & Mirrors might start with a faux version of the present which rings a bit falsely, but it ends with a reverential version of the past that's filled with heart and spirit. Somehow the most retro songs on the album end up sounding the freshest, proving that maybe O.C. is as complicated as he claims to be.